Charlotte hosts world headquarters for eight Fortune 500 companies. Since 1990, new and existing businesses have invested more than $18 billion in the region (Charlotte Regional Partnership 2016). The corporate community is a significant player and landowner in Charlotte and should be involved in this tree canopy effort. TreesCharlotte has made significant strides in engaging Charlotte's business community to preserve Charlotte's tree canopy through fundraising/sponsorship opportunities, along with corporate volunteer days. However, further potential can be untapped in the business community. Invite and incorporate the business community into the newly formed Canopy Team. Consider creating a corporate engagement working group. Make a point to roll out this plan to corporations, ideally in a one-on-one context (peer to peer). Explore connections/options to learn what each corporation is interested in and where missions align. Conversely, identify the needs related to implementation of this plan, and approach the business community with options on how they can get involved. Encourage corporations to participate in the plan by utilizing the same taglines or messaging in their own outreach. ​Corporate Sponsorship to Create/Maintain City Parks. Developers can opt to pay a fee in lieu of saving tree canopy on a development project. Those funds are placed into what is called the Tree Save fund and are earmarked for purchasing conservation land with the goal of preserving canopy for future generations. However, the minimum conservation land acreage per purchase of 40 acres often means that much of the land that is purchased is not necessarily in the same part of the city where the canopy was originally lost in development. However, smaller blocks of land in Charlotte's urban core are available and could be considered for smaller city parks in neighborhoods without much green space. As it stands today, this option is unrealistic due to the annual maintenance requirements of a city park, among other reasons. One option would be to consider using the Tree Save fund to buy land for a city park and obtain corporate sponsorship (with potential naming rights) to fund installation and annual maintenance. Much like large event venues, corporate sponsorship could bridge the needs gap for building city parks, and canopy could be added in areas in dire need. Public-private partnerships in park development could be an opportunity for adding significant canopy to a neighborhood, while providing real benefits to the community. Read more about park partnerships and case studies at the CityParkAlliance.org web site. Connect Power with Trees. Local utilities like Duke Energy or Piedmont Gas may be willing to spearhead the promotion of trees as an energy saver, potentially through participation of the newly established Energy Saving Trees (EST) program. EST is a research-based tool created by the Arbor Day Foundation, intended to help homeowners and utility companies save energy and money by strategically planting trees. ​Utility companies across the country are signing up as partners to help reduce energy use through strategic tree planting. This program enables utility companies to provide free or reduced-cost trees to their customers who plant trees to save energy, and allow property owners to map out online exactly where to plant their tree to get the most benefits. The energy bill insert at the right shows how one of the EFT partners—PepCo—has initiated this program in the Maryland/DC area. 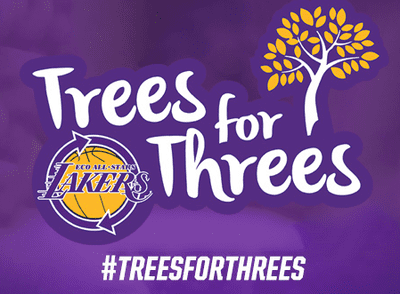 PricewaterhouseCoopers (PwC) is one of many corporations that have teamed up with NBA teams on a Trees for Threes program. 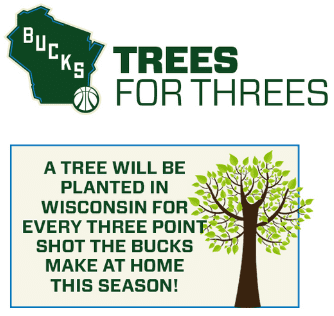 The sponsoring entity and each NBA team has committed to planting one tree for every three-pointer made during ALL regular season home games. In Cleveland, the trees are planted throughout the area with help of Cavs team members, PwC employees, the Western Reserve Land Conservancy, using trees provided by The Davey Tree Expert Company. In New York, the Knicks similarly partnered with PwC and NY City Parks in conjunction with Parks' MillionTreesNYC planting program. The Dallas Mavericks partnered with PwC and Arborilogical Services, Inc. (local tree care experts) and are in their fifth consecutive year on the “Trees for Threes” project. Other NBA teams involved include the Milwaukee Bucks and LA Lakers. Bank of America has partnered with American Forests to provide $250,000 to fund an assessment of the urban forest and climate change in five US cities. "We have a strong commitment to environmental sustainability, which helps us better support our customers, clients and the communities where we do business," says Cathy Bessant, Bank of America’s Global Technology and Operations executive and chair of the company’s Environmental Council.​ "Our partnership with American Forests will help community leaders understand and respond to impacts occurring to the biological infrastructure on which our cities depend.” Bank of America cites their "goal is to help create economically vibrant regions and communities through lending, investing and giving. By partnering with our stakeholders, we create value that empowers individuals and communities to thrive and contributes to the long-term success of our business. We have several core areas of focus for our CSR, including responsible business practices; environmental sustainability; strengthening local communities with a focus on housing; hunger and jobs; investing in global leadership development; and engaging through arts and cultural."